Hahahahahahahahaaaaaaa! You're right, FG: all a person has to do is look at the ears in this photo to tell what's going on! Llama's are up & forward, donkey's are against his head--uh-oh, looks like DDD's going to back off for now. So cute! I love how you always seem to be in the right place at the right time. Carrying your camera with you all over the farm might be a pain, but take it from me and the rest of your readers: it pays off in your fantastic photos. I love the play of colors in today's photo! The subject matter is pretty darn cute, too. Great job! Uh oh, looks like DD isn't too sure of the llama! Awww....poor Donkey Doodle Dandy. I would never have guessed that he would have been the one to back off. Thanks for one more great picture. oh, i dont think Donkey Doodle is backing off, ears back like that on an equine is about the same as when all the hair along a dog's spine stands on end. say it with me in Samuel Jackson voice, "back the heck up, llama! I ain't messin' around"
that's what those ears mean! Dan does not look like a happy donkey. Is the llama trying to eat his special treats? Ann, you got it in one! DDD is definitely NOT backing down...! I just noticed the new fall look of your blog header. Neat! Can't wait to see if there's "winter holiday" version. Little sheepie tracks in the snow, maybe one gets a red nose? Heehee. Cute. I am fond of your blog...would you include mine on your list? I blog about living on the Canadian prairies, spinning, weaving and shepherding my alpacas, sheep, goats and one llama. "You better back down donkey." So cute. Hope it all ended well. I think Uncle Dan may be in need of a super-chicken intervention. Now where did I put that cape? I think DDDan doesn't want to give up sheep guarding to a silly-looking llama! "Dude. Susan. Llama is staring at me. You know, in that way. Why are you taking pictures. DO SOMETHING! You have the power to stop this!" It was really interesting going back and looking carefully at this photo after reading the first few comments. I realized that if you don't know what is actually going on, it does indeed give the impression that DDD is a bit nervous and seems ready to back away from his treats. And the llama does have a pretty stern look on her face. But Ann figured out what was really happening, and I don't think I could have phrased it any better myself, LOLOL. The ears went back, and he was ready to defend his breakfast! Sharing with Cary is one thing. Sharing with somebody bigger than you is something else entirely. Of course it kind of wasn't fair posting just this one photo, as it by no means tells the ENTIRE story of what has been going on around here lately. 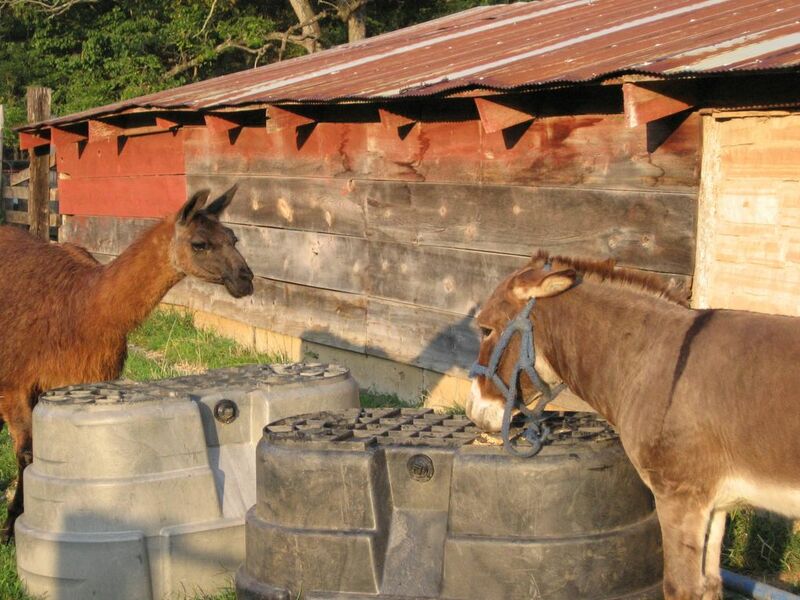 (Let's just say Miss Llama had every right to be casually inspecting Dan's treats.) I didn't want to give the wrong impression--I just love the photo and couldn't resist sharing it. Our mornings have become quite complicated (and I've been taking the pictures to prove it). In fact, Joe says that he can't go down and take care of the animals first thing in the morning anymore (letting me, say, sleep in a little) because he knows that we have so many little rituals and routines that he would inevitably not only mess up--but probably piss off half the critters in the process! (And nobody wants a bunch of hungry barnyard animals pissed off at you, LOL.) This is definitely not some lazy excuse--I know he's right. One of these days I'll hopefully have a chance to describe our mornings in more detail for those who are interested. Like I said, I've been collecting photographic evidence. A super chicken intervention is an admirable and caring idea, BUT have you already forgotten what happened the last time you flew the coop? I haven't. Geez. Oh yes, we certainly have a power struggle (or two or three) going on around here. And as for me having power--ha! Right. Sometimes I am allowed to think I wield true power and am in charge of everything, but, really, we all know that's so not true. I'm a Slave To Quadrupeds (And Poultry). Good thing I love my job (and they're all so cute and entertaining). I feel a little better knowing that Dan's ears aren't shying away, but taking a stand instead. I was deciding that I wasn't so sure about the llama moving in and playing "Alpha Farm Animal" with Dan. After reading the real thing behind the ears it actually makes me wish some morning treats Miss Llama's way. But I know that you are probably taking care of that. Funny how you can see both things in this picture. It is not really kind to bring up these past indignities, Susan. Anyway, if you keep reminding him, Jeff, a/k/a The Poultry Laureate, may write another poem. What rhymes with llama, Jeff-y? How about "trauma"?